Your Position: Home > Scenic area > How to Protect the Gorge ! How to Protect the Gorge ! Tiger Leaping Gorge is one of the world’s top ten popular trekking areas, now is china AAAA international park. the centre of China's three great rivers nature heritage park, Tiger Leaping Gorge is the home to a great number of rare animals and plants and has been designated a provincial-level nature reserve. Because of the fragility and importance of this Nature Reserve, all visitors are asked to follow this Code of Conduct so as to ensure the Area's biodiversity and cultural heritage is need effectively protected. We know that popular guide book "lonely planet" in English version from 1988- 2008, not mentioned about how to take care of the nature or Protact the Gorge, the "wikitravel.org/en/Tiger Leaping Gorge" public web even don't care and mentioned about how to keep the area nature...? I believe that western words" what you have is not important, important is what you do". if you really try to protect gorge, you have to be at least spend more tension, only think of cheap people can not be support Gorge and protect gorge !! now Sean of course is the owner of Sean's Spring Guesthouse, it is 30 years running in the gorge, Sean use the own Guesthouse foundation to develop the village ,pay all stuff to set up the Walnut grow project and try to help the all gorge area's local economy , you can link Walnutcoop to see what we plan for future! so at least if you stay Sean's place shows your honest mind to support this area poor local people and protact this long turn Torism for the next youth generation ! Stayed here in Nov 2011 with a group of 12 cyclists riding through the region. Rooms are good, food is good, outside sitting area is also good. Shaun has a wierd honesty system for drinks etc, while they are expensive I'm sure he gets ripped off by people not being honest. Overall it was a comfortable and pleasant place to spend a couple of days. A great spot from which to visit the gorge. Sean can guide you on hikes (for a fee) or explain you how to explore the mountains on your own. The guy is also involved in all kind of community initiatives and sports events. 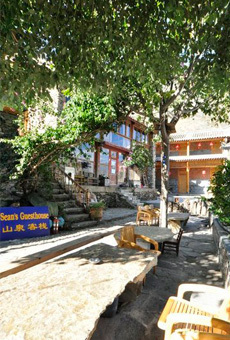 Check out the ultra-marathon through the TLG that starts from Sean's guesthouse. It is a yearly event in April. You can hike down to the river from the guesthouse, see picture. Please help to protect the fragile ecosystem and wildlife of the area by following the guidelines set out below. Do not start any fires within the Nature Reserve. Support the local enterprises rather than the businesses set up with outside money (recognizable by the architecture which is unsuited to the local environment). Support the businesses run by the locals, who maintain the environment and the heritage of the gorge. Cheap and dirty modern concrete businesses are detrimental to this heritage and to the environment. Take good care of the businesses who help you get the right information. Take good care of the quality products and the people who provide them. Give thought to the people living in the gorge and give them your business, so that they may expand the gorge facilities in a manner consistent with their heritage and harmonious with the environment. If you are a visitor coming to do research, training, or filming, please get permission from the Nature Reserve staff. You can buy local products to help improve the lives of local people, but please do not buy endangered wildlife products such as fur, feathers, and leather. When you are watching the birds, please do not wear bright clothing, make loud noises or frighten or feed the birds. Please do not come within 100 meters of the birds. Cultural Conservation: Remember to respect the property rights of the local people. Try to be helpful to each other, do not just take from the local people. Respect the local people and their customs and religion. Do not touch things before you get permission, and do not be loud and disrespectful in the village. Ask permission before you take pictures in the villages, especially when you take pictures of people. Respect holy and sacred places and do not touch or move religious objects. Giving to children only encourages begging. A donation to our Conservation and Community Development Fund is a more constructive way to help. Visitors who value local traditions encourage the local pride and maintain local cultures. So please show an interest in the culture of the local people and an interest in understanding their traditions.